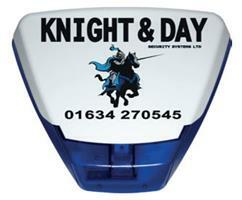 Knight and Day Security Systems Ltd - Alarms/Security based in Rochester, Kent. Our reputation is the heart of our business which is why we provide the best possible advice and a service second to none. Our highly skilled team will guide you, we will design and install, maintain and monitor your tailor-made security and burglar alarms Medway packages. Here at Knight & Day Security Systems we believe strongly in the long established brands like Castle / Pyronixs, Texecom and Honeywell, who have a range of equipment to meet all of your security requirements at a competitive price. Our CCTV Can Be Remotely Viewed By Smart Phones, PC, Laptops Or ipads. For a no obligation appointment to your home or business, please call us on 07587 703658 / 01634 270545 or email [email protected] and we will prepare a personalised quotation for you.